It has been some months since 3.5 Beta 4 – a little longer than planned, however many fixes have been made since then, and we are now very close to the 3.5 release. If no major problems are found, XBMC4Xbox 3.5 final will be made in the next week or two. Please do test out this release candidate as it will be the last chance to get any changes/bugfixes in before 3.5. Removal of all the defunct and broken scrapers, fixing up some problems with the imdb/tmdb scrapers and adding a new default music scraper that uses the http://theaudiodb.com API. Updated Python to 2.7.8 and added some missing Python API functions from XBMC. Fix for browsing library when network is not connected. 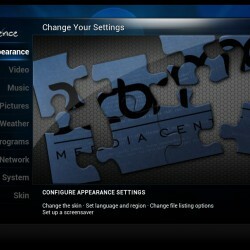 Improvements/fixes from XBMC for ID3/Tag parsing, CD Ripping, and Playlists. Updates to the included Addons4Xbox installer. For further information you can refer to recent commits from the Redmine Repository Browser. Thanks to Dan Dar3, brentdc42, and psyko_chewbacca for contributions/bug fixes and all those who help out on the forum. [EDIT] Unfortunately RC1 has a problem with RTMP streams. I will be pushing out a RC2 soon with a fix. Apologies.